With a look at the current book market, and in a time when reading is clearly in decline, over the last few years an interesting phenomenon has taken place. The majority of top-selling books, for example on Amazon.com, have been “Adult Coloring Books.” I remember that I initially did not even want to go there – I did not even want to know all the details – the concept sounded just too childish. Things changed when I saw grown-up people at an international book fair lining up at a book stand to color images a publisher had put up for display and interaction. What I saw on people’s faces was a joyful expression, a totality and enthusiasm you usually only find in children involved in creative work. The same phenomenon I then saw again at a “Creativity Night” at the OSHO International Mediation Resort in Pune, India. Large numbers of adults getting involved in activities which many of us remember from kindergarten: A friend, a retired judge, was involved in painting with a glowing face, a childlike simplicity and innocence which often we adults lose when we grow up, and another, the CEO of a major tech company, getting his hands painted with red dye, a tradition in some regions of India, with such a joy about him! In a world where our day-to-day lives are more and more dominated by technology, with its ever increasing speed and demands on us to keep responding to screens of all sizes, either in our hands, at our workplace, or at home, there is a longing for simplicity, perhaps for that space we experienced in kindergarten when we colored in line drawings. 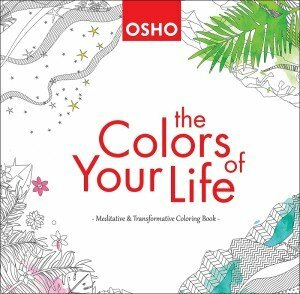 I think the success of these adult coloring books is connected to a deep longing which Osho has also spoken about a lot in his talks: the search for the paradise we have always been longing for. On-demand entertainment has taken the place of first-hand experience and creativity in many areas of our present world. But entertainment is quite different from creativity and experience: In creativity, you are a participant; in entertainment, you are only a passive spectator. It seems people want to be creative, want to experience, and they will find ways. “Become a child again and you will be creative. freedom from knowledge, freedom from prejudices. A creative person is one who can try the new. A creative person is not a robopath. Robopaths are never creative, they are repetitive. In this context, the concept of The Colors of Your Life was developed – including this current popular trend of coloring books, and adding valuable Osho insights in words – his message of awareness and meditation – creating a bridge from the unconscious to the conscious. We found a designer who, in a very passionate way, transformed the well-known images from the Osho Zen Tarot into line images for coloring. And, for each of the former tarot cards we found an Osho insight matching the theme of the image. THE COLORS OF YOUR LIFE: A Meditative and Transformative Coloring Book. We are not just coloring in these images, they help us to reflect on the colors we give to our lives. And this includes all the “colors,” all aspects of life – not just the “easy” and “positive” aspects, represented here by images for things like “Playfulness,” “Courage,” “Celebration,” and “Creativity.” Through these images and Osho’s words we also learn how to literally and metaphorically find colors for aspects we might not value so much, or might even see as “negative,” here represented by images for “Aloneness,” “Guilt,” “The Burden,” “Stress,” “Exhaustion,” “Sorrow,” and so on. Osho’s insights transform all of these aspects and give them a depth. Adding our own colors to all of these aspects thus becomes an invaluable enrichment to our understanding of ourselves and who we are. Those aspects we like or value as positive become more individualized, and the aspects that we label as negative we learn to integrate and to recognize as experiences and expressions of ourselves that have their own place, their own lessons to teach us. A friend who had a look at one of the first copies of the book when it came from the printer said “Wouldn’t have been fantastic to have learned about all of these aspects in school?” Yes, and many, if not most of us, did not – therefore this book is also a great teaching tool, with invaluable lessons for people of all ages. The shared insights create space for healthy reflection on the many aspects and seasons of our lives, allowing us to acknowledge and befriend all of these aspects and integrate them. In expressing what is unique and original about ourselves, we are also helped to regain a child-like, rather than a childish innocence. This book is a celebration and encouragement of and for creativity and meditation, and also makes a great gift for people not yet familiar with Osho’s life-affirmative approach.